Capalbio: a travel guide to the village of Capalbio, hotels, farm holidays, campsites, holiday homes, apartments, real estate, accomodation, beach, boating, sightseeing, photo gallery, top things to see. 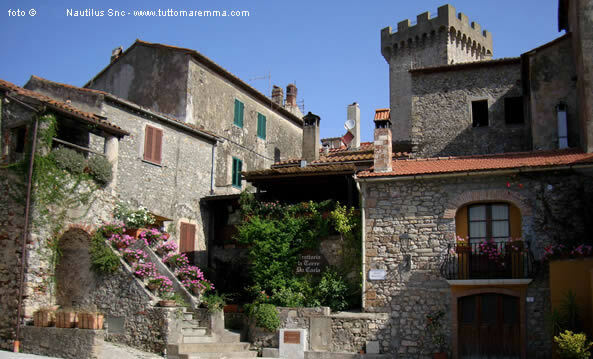 Capalbio is an ancient village surrounded by the Maremma countryside. Inside the medieval walls you can "feel" the old atmosphere of the past centuries; walking through narrow streets, little squares and old walks will bring you back to the past. At present Capalbio is one of the favourite holiday destinations for a number of sophisticated and demanding tourists, VIPs, show business and movie stars, who can appreciate arts, nature and taste the essence of a safeguarded area. In the village of Capalbio you can enjoy a stunning view from the crenellated tower as well as along the medieval walls of the Castle (the building belonged to the Aldobrandeschi family and houses Giacomo Puccini's Piano). Besides, we suggest that you visit the XV cent. little church of St. Nicholas and the Providence Oratory where you can admire a fresco ascribed to Pinturicchio. The woods surrounding Capalbio are ideal hunting areas, a very popular ancient tradition in this territory, especially the boar-hunting. Other naturalistic destinations are the W.W.F. Natural Reserve near the lake of Burano, the sea coast and the very long beach stretching along the thick Mediterranean flora. Traditional cuisine is also remarkable, you can relish wine and food renowned the world over as well as delicious fowl dishes. Last but not least, don't miss a visit to the wonderful masterpiece by the French-born artist Niki de Saint Phalle known as the "Tarot Garden" near the village of Capalbio, with its 22 huge monumental sculptures inspired by the tarots.